Bangkok is huge and brimming with all kinds of different activities. Many travelers plan 3 days in Bangkok, especially if it’s their first time. If you’re also a first timer, temples and red-light districts will probably spring to mind, but ever wonder about the hidden gems that are unforgettable in their own ways? Our 3-day Bangkok itinerary offers you not only the popular things to do, but also local insights on where to go, what to eat and tips to make your stay in the metropolis great as well as different. First things first, where you stay in such a bustling hub will make a huge difference on the overall experience. Find out our favorite areas and neighborhoods in Bangkok with both easy access to public transportation and vibrant local scenes in Where to Stay in Bangkok. Then, there are a few noteworthy things that will help you have a smooth and safe experience in the one-of-a-kind capital. – Buddhism is considered Thailand’s national religion. All the Buddhist religious objects as well as conversational topics are highly sensitive. To avoid stepping on the locals’ toes, cover your chest, back, upper arms and upper thighs in temples. – Don’t point your feet at religious objects as well as someone else. Putting your feet on a table or a chair is also considered rude to Thais. – You probably know this one already, so we’ll just be upfront. Taxi and tuk tuk scams are common, but read on for our local tips. Keep them in mind and off you go, worry-free! 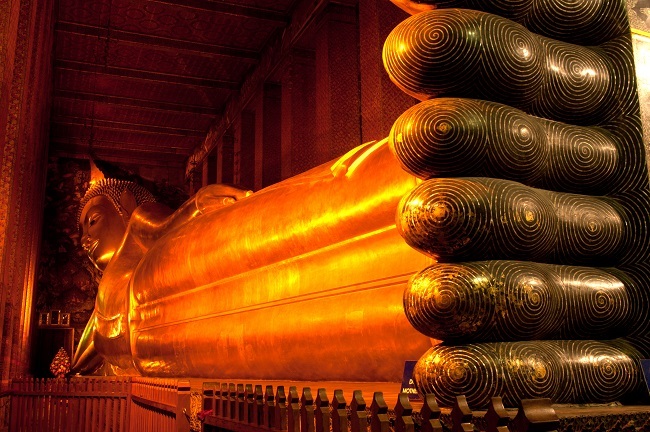 As for our 3-day Bangkok itinerary, some must-sees are only open on weekends. Don’t be sad if you can’t make it, though. We’ve included the locals’ favorite hidden gems as alternatives. One last thing, we love food. By love we mean we, the locals, occasionally go food tasting on weekends. You’ll come across names of food stalls in like every other paragraph and they are our genuine favorites! Day 1: Squint at the temple glint. Stroll along the Instagram-worthy old town. Fine dine by the Chao Phraya River. After breakfast, feast your eyes on the dazzling gleams of the Grand Palace, an absolute must-see and the most sacred place for Thais. It was built more than a couple centuries ago as the royal palace, hence the name. Although royalties stopped living there after around a century, the Grand Palace still hosts royal traditions and welcomes royal visitors. Inside the complex is Wat Phra Kaew or Temple of the Emerald Buddha, Thais’ most revered Buddha image. A royal tradition takes place here at the debut of each season, where Thai king changes the seasonal attire of the resplendent Buddha. – Bring a hand fan, and a handkerchief if you like. You can thank us later after you’re done dabbing sweats off your forehead. – They do turn away inappropriate dressers. Also, no strapless sandals are allowed. However, they lend clothes to cover you up. Passport and a 100-baht deposit are required. Then, right next to the Grand Palace is Wat Pho, another royally affiliated temple considered Thailand’s first ever university. After marveling at the bigger-than-life Reclining Buddha and enormous intricate pagodas, don’t forget to find the two Wat Pho giants and say hello. Then comes the best part (yet), treat yourself to traditional Thai massage. Massage parlors are so ubiquitous you might be skeptical about them, but did you know that Wat Pho itself is the original Thai Traditional Massage School? And yes, you can learn Thai massage and start your journey to wellness here, too! Now you might be craving a bite after all the walks (and the sweating). If you feel like it, you can take a 15-minute walk to Thanon Phra Athit (Phra Athit Road). If the heat is getting too much, just hail a cab or a tuk tuk. Taxis are cheaper, but we get that tuk tuk is one of Bangkok’s icons. If you want to try this local ride, keep in mind it shouldn’t cost you more than 100 baht. – Never get on a cab if the driver refuses to use the meter. – If you’re being ripped off and know the approximate real fee, just say the price. Most of the time you’ll be able to settle it. – Download Grab app, just in case. Sometimes it’s cheaper than taxis, sometimes only a bit more expensive. Most Grab drivers are also able to communicate in English. – Khun Daeng’s Vietnamese Noodle: We know what you’re thinking about the name, but Vietnamese Noodle is an integral part of Thai street food. We personally find Vietnamese Noodle in Vietnam a whole lot different than the one at home, though. This pepper-infused gooey soup could be hotter than the heat, but don’t let that scare you away. At least you’ve still got the hand fan. – Karim Roti Mataba: Make sure you get one of the crispy deep-fried Mataba with myriad fillings including minced pork and shrimp. – Escapade: They serve good burgers. The place is quite tiny, but we think it’s quite cool as it gives you a feeling of sitting in a hidden trove. After filling up, stroll along the street and take in the local architectural charms. For coffee-lovers, hide from the afternoon heat behind a glass of iced-coffee in cozy cafes. If you’re a museum geek like us, you’ll definitely find Pipit Banglamphu Museum delightful! 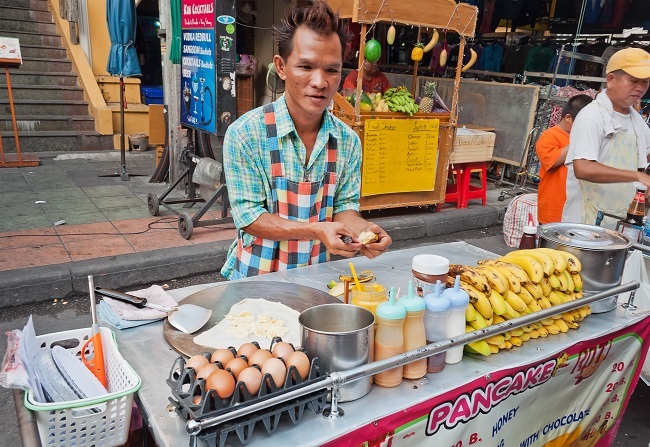 It houses edible history of Banglamphu, one of Bangkok’s oldest and jolliest neighborhoods. On the second floor, you’ll find a locally-made official list of what to eat in the area. Most of these stalls have been here since our parents were teenagers. How neat! Don’t stand there drooling over the pics for too long, for most stalls in Banglamphu are closed around 4-5pm. Time to move on. In case you’re more into history and are now coming out of the museum starving for dinner (You might not be, but we’re pretty sure we would…) What better way to say thank you to your body for withstanding Thailand’s heat than a riverside dinner. With sunset to boot. Sala Rattanakosin serve both Thai and fusion food. The reason all their tables are usually fully reserved is the riverside view of sunset over the Temple of Dawn, though. 3 days in Bangkok itinerary: This is what we mean by riverside fine dining! Self-explanatory. Besides these two, there are several other places with different price ranges that offer more or less the same spectacular view. 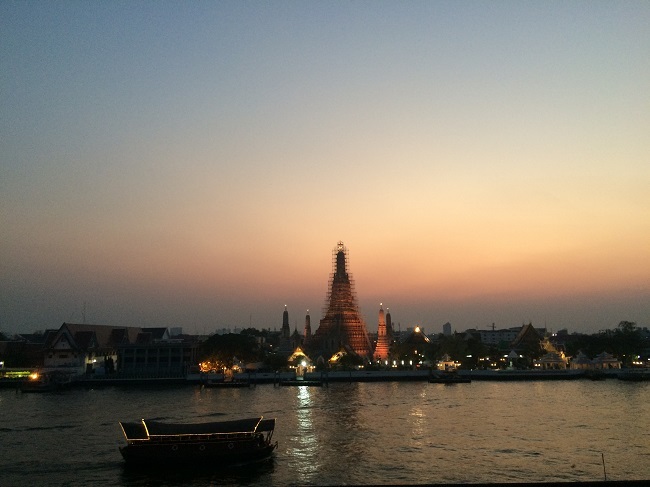 We truly hope you get to experience the majestic and serene Bangkok Old Town sunset – our all-time favorite! Day 2: Shop but don’t just drop! 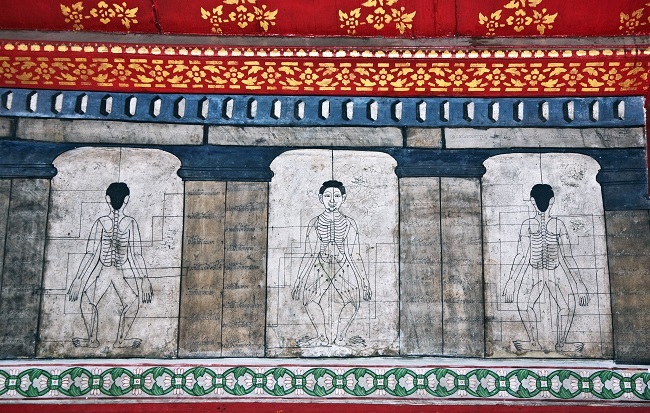 Dive deeper into Thailand’s history and culture through National Artists’ masterpieces. Go street food hopping for dinner. Who knows what day of the week you’ll be in the capital, so we prepare two versions of Bangkok itineraries for you. Need we say more about the renowned Chatuchak Weekend Market (JJ Market)? We’re pretty sure it’s already on your absolute must-go list. What we’re offering instead is a rundown on what JJ Market flaunts (cheap clothes and all kinds of plants). And what it hides (hand-sewn Bohemian dresses, elephant-shaped cutting boards, decade-old leathercraft shops, etc.) Find out more here! 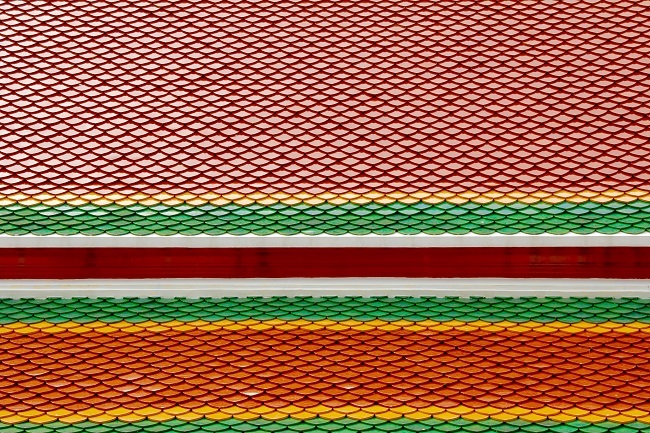 From Chatuchak Weekend Market, hail a cab (or a Grab) to MOCA, Museum of Contemporary Art. 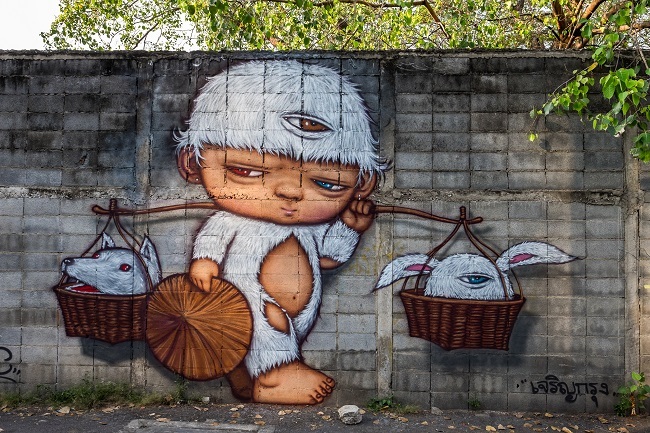 It’s a tad bit further out of town, but if you want to go beyond the surface of Bangkok, the wide varieties of Thai National Artists’ paintings and sculptures do a great job on shedding light on Thai social norms and beliefs. Take a peek at some of the artworks here! Now for an alternative for Chatuchak Weekend Market. These are the real hidden gems, even to the locals! Start off with one of the oldest yet hippest neighborhoods, Charoenkrung (near Saphan Taksin BTS Station or Hua Lamphong MRT Station). Besides the famous Yaowarat Chinatown, Charoenkrung has its own collection of Chinese-style shop houses. Most of the owners were second-generation Thai-born Chinese whose immigrant parents’ hard work paid off. They were able to rent state-owned shop houses and work their magic on the retail business. Today, Charoenkrung’s charms include retro architecture, chilled out vibes, groovy eateries and live jazz bars. From Charoenkrung, walk on to Talat Noi, another Chinese community spawning from the trading hub of Sampeng a couple hundred years ago. As the natural rule of change, the buzz has fizzled out today. The good news is, the laid-back way of life remains and it’s actually a rare gem in the midst of Bangkok’s rocketing skyscrapers. Another newfound gem in Talat Noi is So Heng Tai, a Chinese mansion turned scuba diving school. From quick Instagram-worthy shots to a short scuba diving course before heading off to Southern Thailand, this older-than-Bangkok Hokkien-style villa has got it all for you. Oh, did we mention they also do Beagles farm and cafe here? What a tempting amalgam! Across the Chao Phraya River is Kudi Jeen, a cordial multicultural community home to Thais, Christians, and Muslims. They have been going strong together for over 200 years! You’ll find the lovely pink Santa Cruz Church, the Hokkien-style Kian Un Keng Shrine and the world’s only Buddhist temple-inspired mosque called Kudi Khao. They all stand at such close distance from each other that you could do a religious site hopping! Now, whether you’ve done the weekend or weekday plan, we suggest calling it a day at Yaowarat Chinatown! You’ll find countless food stalls and vendors with all kinds of delicacies. But to be honest, it isn’t always easy to make good restaurant choices. Since you only have one night, we suggest you avoid making the mistakes. Check out these food tours by the Chinatown-savvy locals. They’ll make sure you don’t miss the unmissable! Day 3 Take it slow and go with the floating market flow. Save your vim and vigor for Bangkok nightlife! By now you’ve covered pretty much all of Bangkok’s musts. Plus, we personally aren’t very keen on crammed schedule, so let us show you how to take it slow. This way you can also save some energy for nightlife on your last day in Bangkok! Again, we have two cool options for you. Did you know that besides fancy upscale malls, Bangkok has its very own local floating market? We assure you it’s authentic and local (we’ve barely seen foreigners). Plus, it’s only a convenient 15-min ride from Bangwa BTS Station (the last stop on Silom Line). 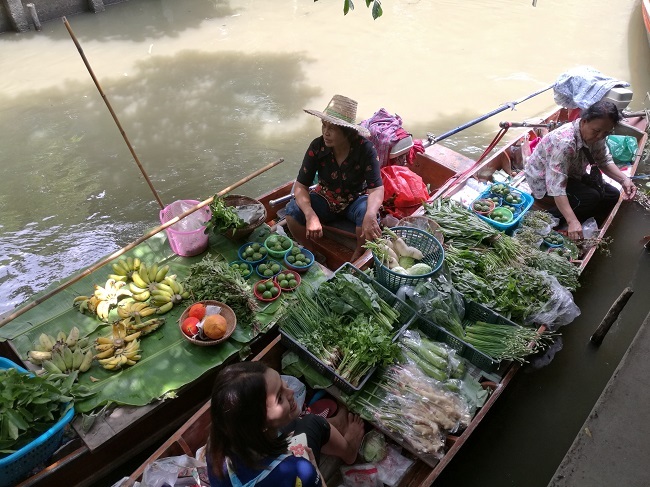 At Khlong Lat Mayom Floating Market, you’ll find yourself immersing in the constant flow of upbeat exchange of greetings and goodies. What’s more, you can enjoy a paddle boat ride along the quiet canal or hop on a long-tail boat to a local temple and an orchid farm. After a boat ride, you’ll definitely come across a huge variety of suspicious-looking grub. We say give them a try and you might discover your new favorite Thai treats! In case you aren’t the most confident when it comes to trying a new bite, our Local Experts will be happy to show you what’s yummy. They will also spell out that mysterious spices behind your Tom Yum Kung’s heavenly smell as well as stories. In fact, we suggest you leave some room in your belly and learn how to make home-cooked Pad Thai with the travelers’ favorite – Tour the Authentic Khlong Lat Mayom Floating Market and Learn to Make Home-Cooked Pad Thai. Don’t cry if, again, you happen to be here during weekdays, because Bangkok never runs out of hidden gems. Head to Khlong Bang Luang, a riverside local community where candid daily life goes on. Among the highlights is The Artist’s House, where you can try your hand at arts and crafts and witness the spectacular and extremely rare Thai Puppet Show. Thai Puppet Show is one of Thailand’s finest long-standing national arts. It depicts anecdotes from the Indian classic epic Ramayana. We still marvel at the graceful gesture and subtle harmony between the puppeteers and their marionettes. This is not to mention the intricate details and oriental glimmers on the puppets’ apparels. Awe is an understatement! Can you believe it’s already been 3 days in Bangkok? 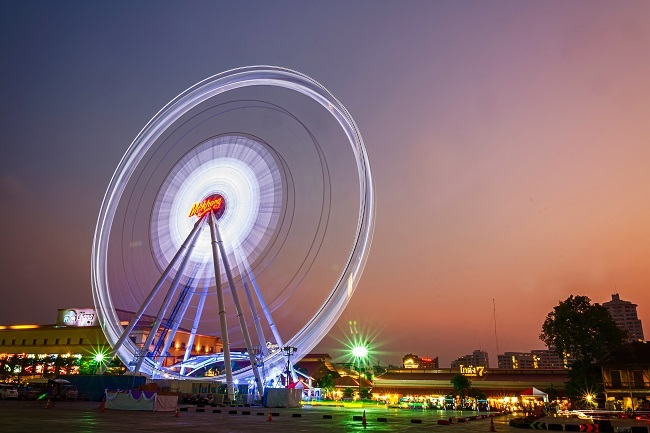 Before leaving the metropolis, make sure to check out Asiatique The Riverfront – an open-air mall that’s among traveler’s all-time faves. Ever seen the radiant neon ferris wheels when riding past BTS Saphan Taksin? That’s where Asiatique is. Sit down for a laid-back upscale dinner or grab a drink and stroll along the breezy Chao Phraya River. Then, clubbers have practically infinite choices of where to own their last night in Bangkok. For a wild experience, head to backpacker hub Khaosan Road. You’ll see fried-bug vendors, tattoo shops, secondhand bookstores and Thai ladyboys within arm’s reach. – Mulligan’s (Irish Bar): Intoxicating live band. Savory deep fried chicken. Not recommended for long talks. We got a sore throat over a catch up with our friends last time. – The Club: Mostly EDM music and packed with both locals and foreigners. – Adhere 13th Blues Bar: Awesome live blues, hence the name. A rotation of various other bands playing different kinds of music, too. – Jamjun: Laid-back rooftop bar with live band. University students’ favorite due to the price and the vibe. 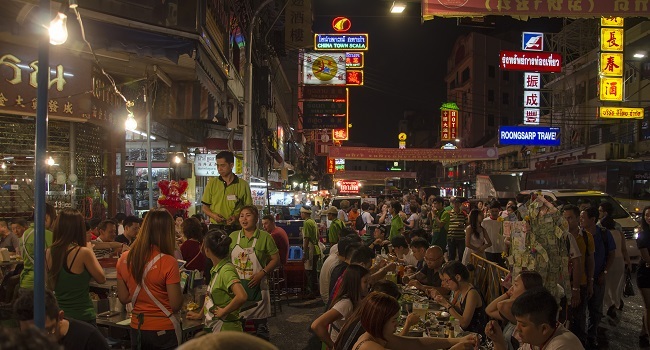 If you find Khao San Road too overwhelming, opt for Thonglor or Ekkamai (Both on BTS Sukhumvit Line) – upscale downtown neighborhoods with an assorted range of live EDM clubs to classy bistrots with au courant Thai music, and secret bars where the energy is infectious. How’s that for 3 days in Bangkok? We hope our 3-day Bangkok itinerary inspires you to go beyond the usual popular attractions and discover something unique. If you plan to stay longer, though, Bangkok and the vicinity have a lot more to offer. Find more Thailand travel destinations and activities in 100 Best Things to Do in Thailand and local friends to show you around at TakeMeTour.